Do you have a tax levy, such as a wage garnishment for unpaid taxes? Have you been visited by an IRS agent or received a notice of payment due? Are you searching for tax defense and relief from a specialist in tax resolution but can’t pay the high cost of a tax attorney? If you answered yes, there is good news for you. As an IRS Enrolled Agent (EA), I am licensed by the US government to represent Los Angeles county taxpayers before the IRS, release and remove your tax levy and wage garnishment, settle your debt, prepare your back taxes, and help you achieve a fresh start. I work personally and confidentially with every client at a reasonable flat fee quoted up front and will get you the same resolution and relief as high-cost tax attorneys one would find in Naples, Belmont Shore, Bixby Knolls, or downtown Long Beach who charge $300–$1,000 per hour. I have personally represented 2,000 taxpayers over the past 20 years before the IRS. Only CPAs, tax lawyers, and Enrolled Agents (EA) are allowed to talk to the IRS on your behalf. Enrolled Agents, however, are the only tax professionals who are licensed by the US government and who specialize in tax resolution. Your CPA may know how to prepare your tax return, but he may not know all of the IRS or FTB resolution options when you can’t pay your taxes. I specialize in tax relief and resolution. A tax attorney is a good choice for defending you in rare cases of tax evasion and fraud or when you want to sue the IRS; but in the case of removing tax levies, settling tax debt, and other tax problems with the IRS, BOE, FTB and EDD, an Enrolled Agent is the specialist you need to represent you at reasonable cost. My firm is an A+ accredited member of the Better Business Bureau and an endorsed local provider (ELP) by Dave Ramsey. Please call us at 1-877-788-2937 or contact us for a free, personal and confidential consultation with me, a licensed Enrolled Agent. About 470,000 people live in Long Beach—almost 5% of the entire Los Angeles County. This includes residents in the neighborhoods of Belmont Heights, Belmont Shores, Bixby Village/Terrace, El Dorado Park, Imperial Estates, Naples, Park Estates, Terminal Island, West Long Beach, Wrigley, and many more. 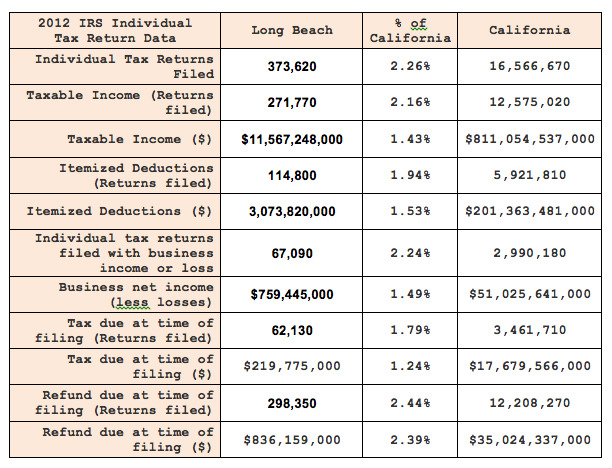 It is certain that several thousand Long Beach residents have IRS problems, such as tax levies, wage garnishments, property seizures, past due tax returns, unfiled taxes, and IRS tax audits. In addition, Long Beach is home to about 15,000 businesses. Many of them also need tax help with or tax levies removed by the FTB, BOE, and EDD. It may seem easy to ignore the government’s demand for payment, but waking up to an empty bank account or a repossession is very difficult. It may seem easy to ignore the government’s demand for payment, but waking up to an empty bank account or a repossession is very difficult. In addition to tax levies, tax liens, and wage garnishments, some cases are referred to the IRS criminal investigation division and can result in imprisonment. Sometimes an officer or agent of the IRS, FTB, BOE, or EDD will even visit your office or home. The fact is, failure to file tax returns is a felony and subject to criminal and civil penalties. However, in my 20 years providing tax preparation and tax resolution services, the main reasons people need tax levies removed, unfiled tax return preparation, and other tax defense services are due to major life events, such as divorce, grief, unemployment, bankruptcy, medical, physical, and emotional issues, or simply procrastination and ignorance. Whatever your life situation is, you do not have to go another day or another year with the added stress of tax levies, tax liens and other IRS problems in your life—and you do not need to pay $300+ an hour to a tax attorney for help. Please call us at 1-877-788-2937 or contact us for a free, personal and confidential consultation with a licensed Enrolled Agent, who charges an affordable flat fee to resolve your case. In 2014 throughout the US, the IRS filed over 535,000 tax liens, requested 1,995,000 tax levies on third parties, and conducted 432,000 seizures through Field Collection programs. You don’t have to become one of these statistics. A tax lien is a claim attached to your assets, such as bank account, wages, or real estate that allows the IRS, FTB, BOE or other entity to seize your property to pay off the debt owed. A tax levy is the actual seizure of your property to pay the debt, such as a wage garnishment. Ignoring tax liens and notice of tax levies only result in much higher fines and stress than is necessary. You have options, such as presenting an offer in compromise, installment plan, CNC-Currently non-Collectible status, and others. But you should not try to release a tax levy or resolve your IRS issues alone. Contact a licensed Enrolled Agent endorsed by Dave Ramsey, who specializes in tax lien and levy removal for personal and quick relief. Whatever your reason is for not filing in the past, it is time to prepare and file now before you lose any refunds or tax credits due to you, and before the IRS places tax levies against your assets or seizes your property. The sad fact is that the IRS has no deadline to collect taxes from you, but they will only refund any taxes owed to you for the past three years. For example, if you have not filed taxes for five years, you can still file your tax return and get any refunds due to you only for the past three years but not for the fourth or fifth year. The longer you wait, the more late penalties build up and the more likely you will get a letter from the IRS asking for payment within 10 days, or even an audit. If you have already received an IRS letter, ignoring it will only result in unnecessarily high penalties and legal costs. But you have a safe alternative— talk to me, Mike Habib, Enrolled Agent. I specialize in tax resolution and am licensed by the federal government to represent Long Beach tax payers before the IRS in your tax defense, so that you can become compliant with the IRS. You can remove the fear and anxiety of unfiled back tax returns and other IRS tax problems from your life. The FTB annually reviews more than five million state and IRS income tax records, as well as records from the EDD, the BOE, financial institutions, and city business tax information. If you have not filed your state income tax, the FTB will decide how much you owe based on the information they gathered, and give you 30 days to pay or prove that you do not owe that amount. If you have received a letter from the California Franchise Tax Board and/or need other kinds of tax resolution services, call us today for a free confidential consultation to assess your situation and receive advice on how to proceed. Has the BOE sent you a demand for payment or placed a lien on your property for back taxes? With 15,000 recognized businesses in Long Beach, you may feel singled out, but it happens to small and large businesses alike throughout the county, state, and country. In certain cases, the BOE will allow you to offer a compromise on the amount owed. Let a specialist in tax preparation and resolution for businesses with an A+ rating at the Better Business Bureau, represent your business at the BOE and negotiate a settlement on your behalf. For a FREE confidential and professional consultation, call us at 1-877-788-2937 or contact us to schedule an appointment. Have you received a payroll tax audit notice by the EDD or have payroll tax 941 tax problems? We know the payroll tax code and can represent your business before the EDD. We can also negotiate an effective tax debt resolution. We handle all of the details of the audit process and negotiation to free you up to do what you do best—run your business. Learn what to expect during the EDD audit process and then call me, Mike Habib, EA, an accredited member of the BBB better business bureau with an A+ rating. I am also an Endorsed Local Provider (ELP) by Dave Ramsey, the TV and financial expert and am an active member of CSEA — California Society of Enrolled Agents, and NAEA — National Association of Enrolled Agents. With millions of dollars in payroll paid out to Long Beach employees, there’s a lot of possibilities for conflict with the IRS. Speak with me for a free, confidential consultation by calling 1-877-788-2937 between 8 am and 8 pm Monday through Friday. Within 50.29 square miles, Long Beach is home to around 470,000 people. This includes over 60 neighborhoods, such as Alamitos Beach, Bixby Knolls, Downtown Long Beach, Imperial Estates, Park Estates, Lakewood Village, Los Altos, Naples, North Long Beach, Shoreline Village, and many more. That means you’re not alone! Tax audits can come in the form of correspondence audits, office audits, or at-home audits. Correspondence audits are the most common and least threatening, dealing with simple tax return requests such as copies of W-2’s or 1099s. It can also be the first stage of more complex audits. Office audits are often more intense and require more documentation, such as an inspection of bank records that you bring into the IRS office. A home visit by an IRS agent is a serious matter handled by agents with more training than a typical tax examiner. While you may handle a simple correspondence audit with ease, the office and home audits are not to be taken lightly. Agents don’t always follow procedures or have good bedside manners. You may not know what your rights are or what kind of information the IRS can legally acquire from you at this stage of the investigation or how they will use the information you give them. You may miss opportunities for an effective resolution by not having an experienced, licensed tax resolution specialist at your side. Get help from a highly reputable enrolled agent. Enrolled Agents are the only tax professionals who are licensed by the US government and who specialize in tax resolution. Your CPA or attorney may not know the IRS as well as I do; I have represented 2,000 taxpayers over the past 20 years before the IRS. Remember that you are not alone and there is help. The sooner you resolve your IRS problems, the sooner your life can resume without IRS fears or continued penalties. Long Beach is the second largest city in Los Angeles county and the seventh largest in California. Officially incorporated in 1897, Long Beach was influenced by pioneer real estate entrepreneurs of the Wild West, such as Jonathan (Don Juan) Temple who purchased Rancho Los Cerritos in 1827. His adobe house is a national landmark and his very own street that he developed, Temple Street in Los Angeles, is a monument to his legacy. Another major influencer was the Bixby clan who were active land owners and ranch farmers. Most notable for Long Beach was John W. Bixby who formed the Alamitos Land Company and began developing a seaside resort, naming streets and laying out parks around the scenic bluffs—areas that are now known as Belmont Heights, Belmont Shore, and Naples. Today, more than five million tourists visit Long Beach—one million at the Aquarium Pacifica in Downtown Long Beach. Others flock to Shoreline Village for shopping and a tour of the famous Queen Mary to stay overnight or attend events throughout the year. As an employer, the Port of Long Beach rivals the US government, “supporting over a million jobs nationally” and generating billions of dollars in economic activity. That’s because over $180 billion in cargo pass through the Port of Long Beach—a pivotal hub between Asia and the US and the second busiest port in America. My office is located just north of Downtown Long Beach off the 605 freeway, I look forward to personally meeting you and handling your tax resolution needs. 3SOI Tax Stats - Delinquent Collection Activities - IRS Data Book Table 16 – Delinquent Collection Activities, Fiscal Years 2013 and 2014, accessed May 12, 2015. 7SOI Tax Stats - Individual Income Tax Statistics - 2012 ZIP Code Data taken from IRS, Statistics of Income Division, Individual Master File System, updated July 2014, accessed May 12, 2015.